re worked in Black & White. I wanted to get a moodier picture and maybe a bit more dramatic. I used Silver FX pro to process and add the grainy effect. drawing the eye straight down the Jetty then up in to the clouds. 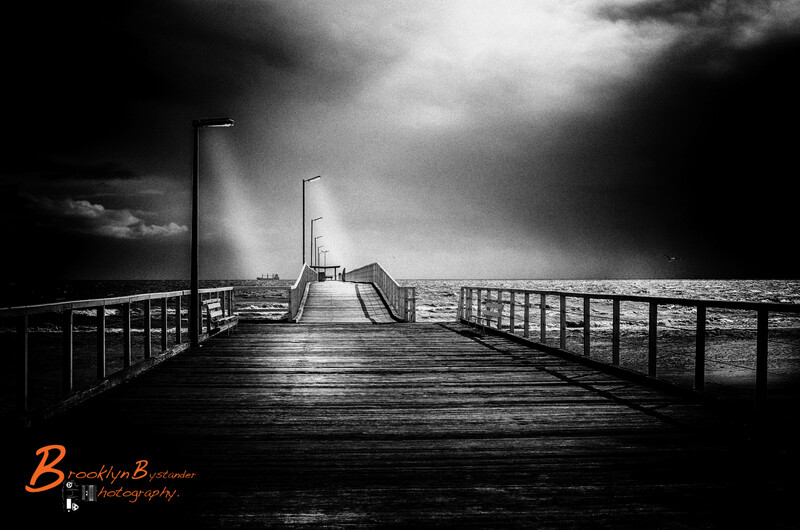 This entry was posted in Photography and tagged Adelaide, architecture, black & white, Jetty, Lightroom, Photography, Port Adelaide, Port Adelaide Jetty, Re Worked, Sea, Silver FX Pro, South Australia. Bookmark the permalink. Mike I think it looks great in B&W. That NIK software does wonders. I like the color version as well. What would it look like after you played on it with NIK? it looks great in B&W, more powerful this way. Great photo. My thought Mike is this is about as good as it gets. What a view and I believe you reached your goal…amazing!!! I have noticed one of your shots Mike…can you please tell me, how can one introduce a trace of color (red), to a B&W composition?? I would be grateful if you could give me a clue. Thanks. all depends on what software you are using to Post process your images. I always find some great tutorials on you tube that can be followed along to. and you can find the tutorial for the software you are using. Thanks very much Mike! I appreciate you friend! It’s already a great shot in color, and the black and white is spectacular! The mood is indeed dark and intriguing at the same time. I love it! Beautiful in black and white; very dramatic! But then one gets more detail in the color version; I was able to spot a seagull. I think they are both beautiful in their own different ways. It may depend on the message you are trying to convey with the photo? Thank you for posting both versions; very interesting! Its amazing how a photograph can be portrayed so many different ways as you say depending on the message the photographer is trying to send. I like it both ways. In b&w, it’s indeed moody, invoking almost ominous tones. The color version is lovely and wistful, like a childhood memory. Clearly, the gift is the strong composition. In the b&w version, the light and shadows does lead the eye down the pier. its great to get the feedback especially from the amazing talents such as your self here on WordPress. and from what you have observed I achieved what i was trying to do. I love what you said here describing Both Photographs thanks you so much fro such a great observation. I have leaned towards Black and White the last few months, May just be a phase !! You know I love this photo….it is my favorite of yours. It will forever hold a poetic place in my heart now. I have stared at both and love them equally. Your talent is unmatched in my mind, Mike. Have a great weekend!! and Skye if you see another Photograph you wish to use. You have my total permission to do so. I love it in B&W! Nice job! 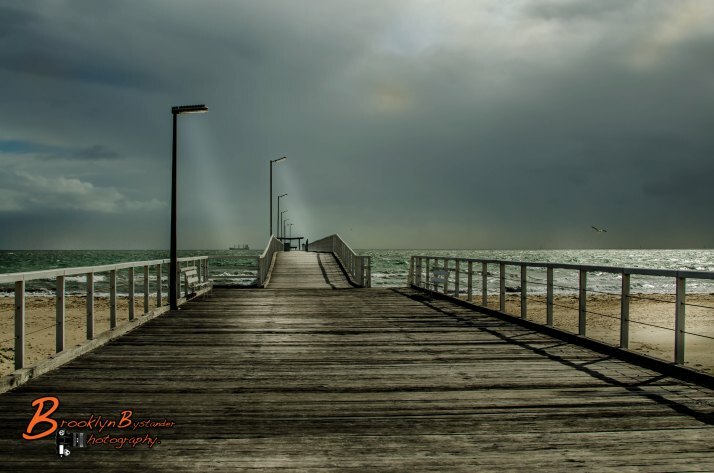 Smashing shot, and I’m especially drawn to the light rays from the LCD lamps; stretching down and illuminating the boardwalk. Stunning in black and white. It really changes the dimensions of the picture and draws your eyes in. Illuminating the pier that is leading to an unknown horizon, one light pointing to a passing ship, one gull (?) flying into the light, leavng darkness behind, one gull in the light. All competing with the light shining within the clouds and on the horizon. We could find all sorts of symbolic messages in this photo if we wanted. What more could you possibly do? I think it’s awesome. Fabulous photo, and thanks for liking my photo essay “Korora Sunrise”. I am now following you. Prefer the B&W. Moodier. Challenging. B&W wins, no contest. So much more emotion and mood.